The red-top tabloids are a rich source of modern folklore and urban legends – and today’s front page splash in The Sun is a case in point. “Girl Eats 4,000 washing-up sponges” tells the bizarre story of dental nurse Kerry Trebilcock who suffers from a rare medical complaint that causes victims to crave objects that are not food. As a result, the 21-year-old has also chomped her way through 100 bars of soap. Evidently this was a slow news day at the Currant Bun, but this a story with legs as well as history. A few days earlier the Scottish Sun, told of a pregnant woman who cannot stop herself swallowing copies of her local newspaper, The Dundee Evening Telegraph. She even keeps shredded pages of the daily in her handbag in case she feels the need to snack. The tabloid obsession with people eating bizarre and unusual objects is nothing new. It’s a tabloid tradition that dates back to the days of Kelvin McKenzie’s editorship during the 1980s when the Sun was competing neck-to-neck with the Mirror for circulation. 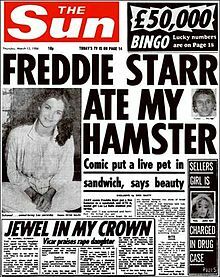 McKenzie was responsible for the legendary ‘Freddie Starr Ate My Hamster’ which became one of the classic tabloid headlines of all time. The silly season may have arrived early this year or this may be a sign of a change in tabloid news values. Given News International’s current legal problems we may be seeing a shift away from celebrity exposes and sleazy exlusives. Maybe we can expect a trip back in time to the news values of the 1980s when urban legends such as the ‘curse of the crying boy’ were the bread and butter of the biggest selling newspaper in the English speaking world? This entry was posted in Uncategorized and tagged curse of the crying boy, folklore, Freddie Starr ate my hamster, Kelvin McKenzie, Kerry Trebilcock, The Sun, urban legends. Bookmark the permalink.